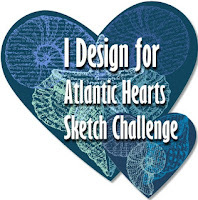 Here's the wonderful sketch from Atlantic Hearts Sketch Challenge. Oh the possibilities of using lots of pattern paper!!!!! I love it! And here's my card using just that, the new Frosted Floral specialty designer series paper. It's is scrumptious!!! Such wonderful pearlescent shimmer. 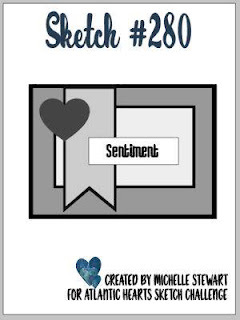 I paired it with the First Frost bundle - stamp set and dies when purchased together, you save 10%. Now join us at Atlantic Hearts Sketch Challenge and share your creation using our latest sketch. And don't forget my upcoming Card Buffet. Check out THIS POST with pictures of the featured cards and how you can get your own card kits absolutely FREE.